Are you getting ready for spring cleaning? DeVere has the products to help you get the job done more efficiently than ever. From carpet cleaners to glass cleaners, we have it all. You may be wondering, “What cleaners do I need?” We can help you answer that question. 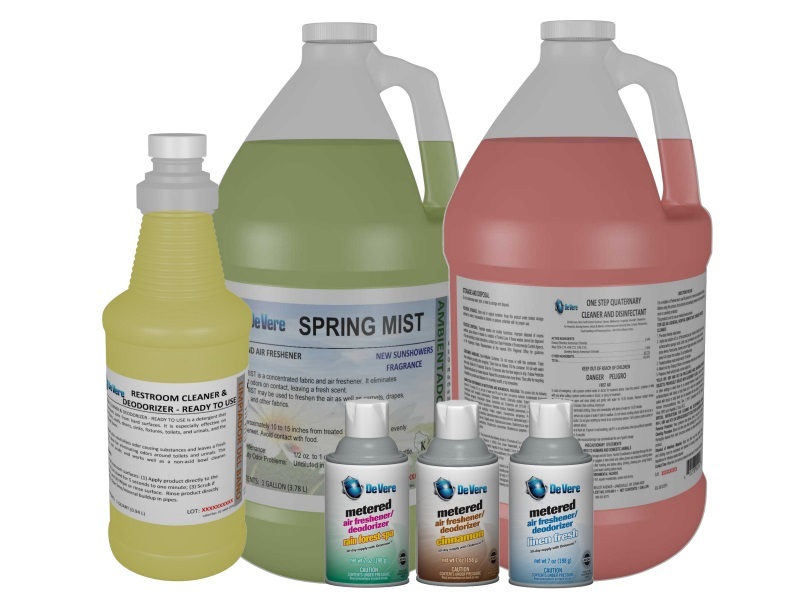 At DeVere, we make hundreds of different cleaners and sanitizers. We manufacture the right product for all your cleaning needs in the plant, offices, and where your customers go. You define what works best for you and your business. 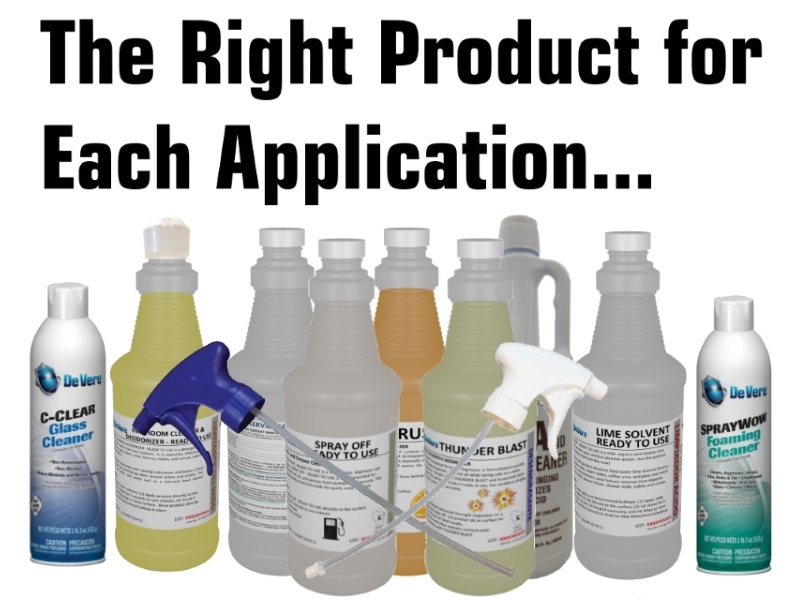 Do you want to be quick with ready to use cleaners, or do you want to save space and money with concentrates? See the guide below for more information. Citrus Ready To Use – Mildly alkaline, all-purpose hard surfaces cleaner and degreaser. QDII Sanitizing Wipes – Quickly and effectively clean and disinfect hard non-porous surfaces with these textured, dust-free, tough wipes. 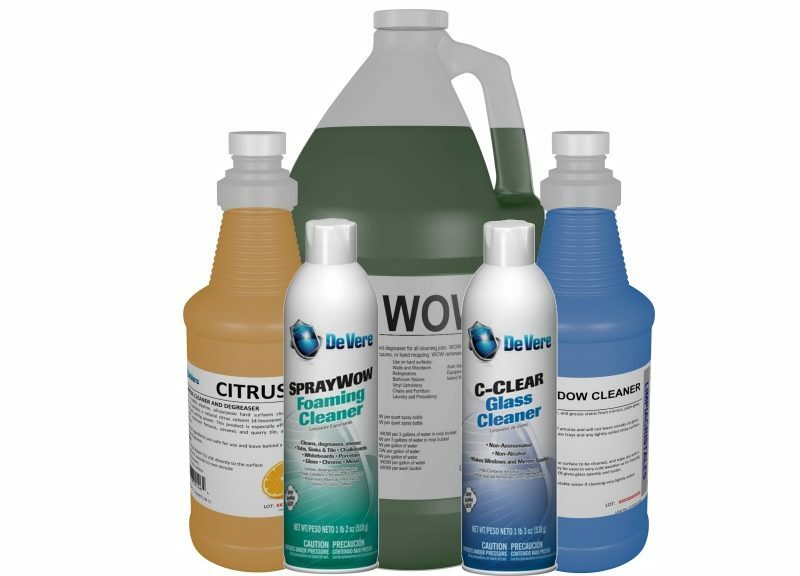 C-Clear Glass Cleaner – Best-selling of DeVere’s aerosol ready to use cleaners. Quickly and effectively cleans glass. Window Cleaner – Removes dirt, oil, and grease stains from mirrors, plate glass, and windshields. Restroom Cleaner & Deodorizer (only RTU in quarts) – Detergent/deodorizer that quickly removes soils from hard surfaces. Bowl Cleaner – Acidic liquid designed to quickly remove soils commonly found in toilet bowls. Carpet Stain Remover – Aerosol that removes tough spots and stains from carpets instantly. Lightning – Newest and strongest mold and mildew stain remover. Thunder Blast Degreaser – Quickly dissolve the toughest grease, dirt, and oil. SprayWOW Foaming Cleaner – Aerosol for all purpose cleaning that quickly penetrates soils for easy removal. Citrus Plus Foaming Cleaner – Aerosol for all purpose cleaning that quickly penetrates soils for easy removal and leaves behind a fresh citrus scent. WOW All Purpose Cleaner – The world’s first of many general purpose cleaners, works best in most situations. Citrus – Similar to WOW, but uses d-limonene and has an orange-citrus scent. Liquid Cleaner – Works best on delicate surfaces as it does not contain any harsh chemicals. Great for cleaning a large variety of surface when you are spring cleaning. Pine Cleaner – Very environmentally friendly and leaves behind a fresh pine scent. 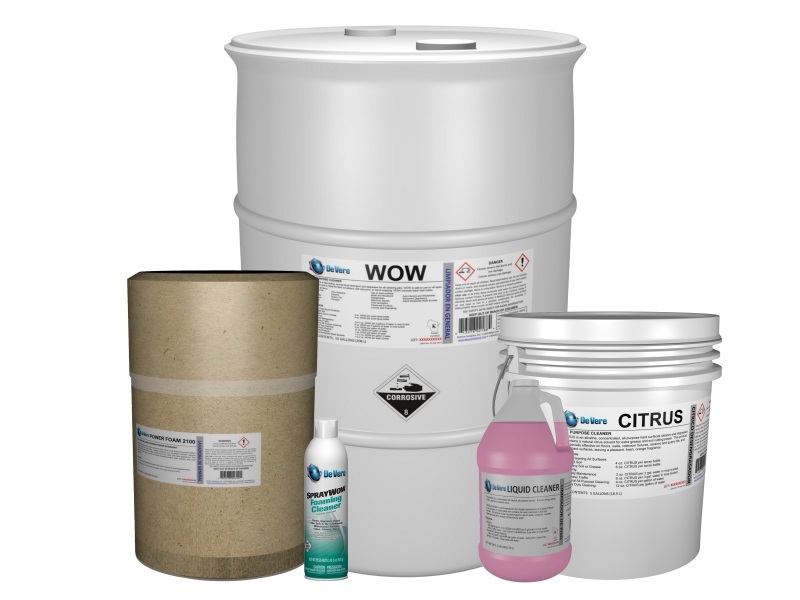 Pure Clean – GreenSeal registered and the most cost-effective product. Extraction Carpet Cleaner – Works on a variety of carpet types and facilitates deep cleaning to remove dirt and grime with ease. Do you need more help finding the right product for your spring cleaning? Check out the “Clean With DeVere” application on the Google Play Store. Please contact us if you have any questions about your spring cleaning or would like one-on-one training or support.